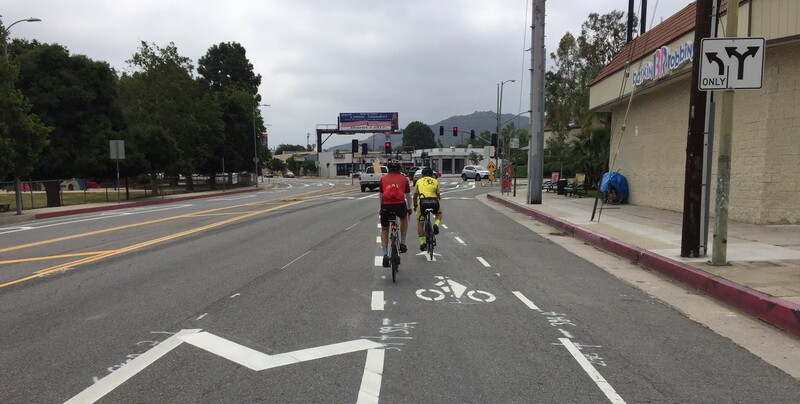 LADOT recently installed protected bike lanes on Foothill Boulevard in Sunland-Tujunga. Photos by Joe Linton/Streetsblog L.A. In early April, LADOT added protected bike lanes to a 0.7-mile stretch of Foothill Boulevard in the Sunland neighborhood of the city of Los Angeles. The protected lanes extend from the Tujunga Wash bridge (just west of Wentworth Street) to Sunland Boulevard. The project closed a gap between existing bike lanes on Sunland Boulevard and on Foothill Boulevard. 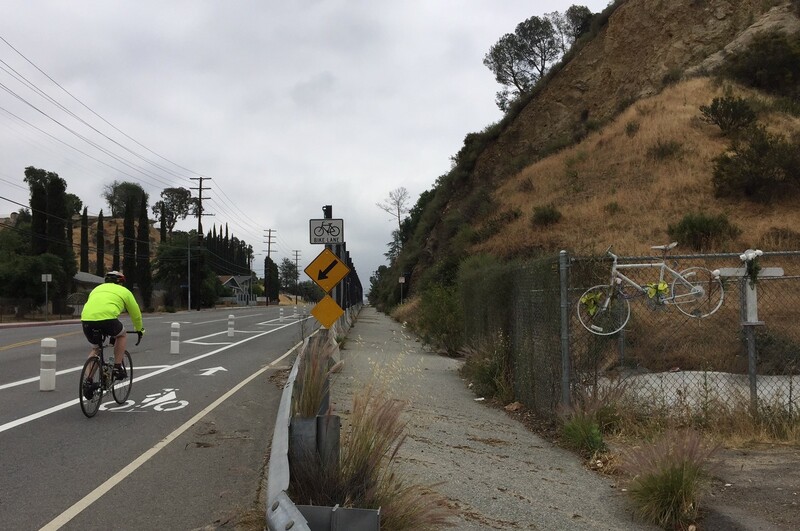 LADOT spokesperson Russell Hassan confirmed that the new bikeway was a Vision Zero initiative in response to the 2016 crash that killed Jeff Knopp. On November 1, 2016, Knopp was bicycling up Foothill Boulevard just east of Wentworth, when a truck crashed into him from behind, killing him. According to Hassan, the incident highlighted several safety issues there, including speeding, lack of an adequate shoulder, and a history of collisions in the area – with two other fatalities since 2005. In addition, adjacent portions of Foothill and Sunland Blvds are on the Vision Zero High Injury Network. Looking into the eyes of a woman who lost her husband in a traffic collision is a sobering feeling. All of the online bashing dissipates. Reality sets in. I remind all of you reading this that Vision Zero’s goal is to eliminate all citywide traffic deaths by 2025. Zero traffic deaths by 2025. Stay the course. Hold the line. We’ll get there. 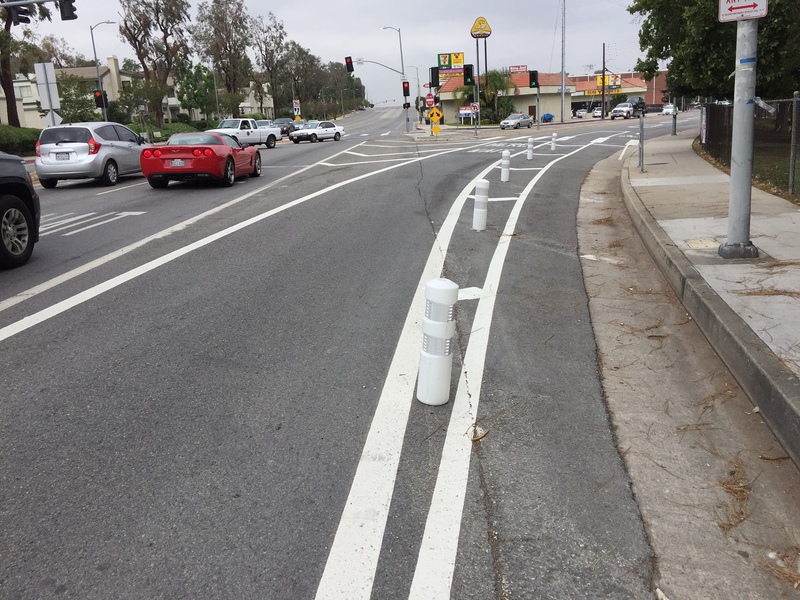 Responding to the community concerns, LADOT made changes to the facility, removing some bollards at Wentworth (for turning buses) and along Sunland Park (to allow for on-street parking accessing the park.) In response to concerns raised about emergency response vehicles, LADOT clarified that drivers can pull over along or in the bike lanes when an emergency vehicle needs to pass. The bollards and bike lane enforcement on Foothill and Sunland Boulevard is [sic] a traffic disaster. Will you reverse and remove them? Though neither candidate promised to remove the bikeway, the candidate responses are instructive. Any time that our lanes are being taken away for bike lanes, we need to have a public meeting where the people who own those lanes – everyone in this room – can come together and discuss the alternatives. Candidate Torossian further went on to criticize the protected bike lanes on Van Nuys Boulevard and ones proposed for Lankershim Boulevard. Torossian later posted a Facebook video where he is standing on the San Fernando Road bike path saying that he generally does not support “taking away lanes” for “paint on the ground” bike lanes, but favors taking longer to create “Class A bike lanes [sic – the facility is a Class I bike path] separated from the roadway” that are safe for kids and anyone aged from 8 to 80. Monica Rodriguez’ debate response focused on the speeding problem on Foothill Boulevard, and the need for Vision Zero. She stated that “at one point we were facing a death every month along Foothill Boulevard” and went on to stress the need for LAPD enforcement against speeding drivers, slowing down traffic, and making sure “everybody is protected and safe.” She thanked the Neighborhood Council for championing street safety. Foothill’s protected bikeway is the sixth protected bike lane in the city of four million. This is located right across my street…….the City took away a car lane in both directions on Foothill Blvd. and made Bicycle lanes……ZERO Bikes use these lanes and now Grid Lock for the Automobiles (Working Class)…….. These are buffered, not protected. Also, the vehicle counts for the street would have helped this article. Glad to see these bike lanes! More bikes coming, they need their own space on the road. I wonder why bikes don’t take safer routes. I can see the need for these lanes. We’ve lived here over 35 years and traffic in the last two or three has become life threatening even if you’re in a car. Passing on the right shoulder and cutting back into traffic lanes the split second (or before) the light changes just to be first. Speeding and passing by using even the lanes for oncoming traffic because 50 or 60 is the “new” speed limit on foothill and even the neighborhood side streets. Stop signs…ha, those don’t mean anything to some. I wish we had the space to put those cement “T rails’ for bikes. You definitely take your chances when venturing out onto any roads around here on a bike. We should all slow down and SHARE THE ROAD! I used the lanes this morning and yesterday evening and have been using them since they were created (and long before then). I ride during commuting rush hour and have observed ZERO grid lock or traffic jams for cars in this area. None. This is the safest route from Sylmar to Tujunga. It took me four traffic signals to make a left from Foothill onto Fenwick towards the freeway. The oncoming traffic was backed up for a couple of blocks. This was at 8:15am. Before the bike lanes, I would have to wait for one or two cars ahead of me and make the first signal every time. It has been this way since the bike lanes. I have not seen a bike using the lanes either. I use that route from the freeway to North Sunland all the time, and often use Foothill toward the golf course to Wentworth. I was there on my bike at 7:45 this morning. No jam or backup in either direction. Typical a$$ response. Grow up and care a little more for your fellow human being. Ms Harris: Perhaps you should consider leaving for where ever you are going in such a ! @#$ing hurry about two minutes earlier. We all know you are in such a hurry to get to Foothill Blvd or Wentworth St. where the 50mph speed limit is much too slow for people like you. Also, I ask what is wrong with kids walking to school. Just because you have observed no bicycles DOES NOT MEAN PEOPLE ARE NOT USING THE BIKE LANES! Please, stop looking at your “smart” phone. Dear Ben Franklin – or whatever troll you are – afraid to use your real name? I leave in plenty of time. I don’t speed. I have to drive to Santa Monica. I don’t see how creating a one and a half lane bike lane is justified. In fact, it is ridiculous. Roads were made for cars, not for bikes. Trying to mix bikes into traffic is a dangerous idea, no matter how much room they have. They should be taking side streets and wide streets not trying to force cars off the road on high traffic roads. A bike lane to protect vulnerable riders and yes, slow down overspeeders, is surely not too much of a price to pay to accommodate everyone on the road safely. I agree with that one. There is no reason to be rude to me. Driving to Santa Monica and not expecting any sort of traffic is mind-blowing, when you have the Metrolink right over the hills in Sun Valley, or the Commuter Express bus that stops on Foothill by Sunland Park. I really find bike advocates to be a rude bunch in general. The people that comment on streetsblog anyway are being incredibly rude. It’s ok to have disagreements but the people on this thread are being immature and inconsiderate toward you. For the record, I support these lanes but I’ve never been to the area- I just think more bike lanes are a good idea, even if they cause some traffic. That said I can imagine it will take time for people to get used to this arrangement. Thanks, Joe. Don’t know why I bother. I am all for bike lanes – implemented sensibly. Thanks for your kindness. What, exactly, did I say that was ^&*$ing rude and offended you? What “one and a half bike lane” are you speaking of? I see one lane in each direction on Foothill Blvd coming into Sunland. Also, the single car lane in each direction is more than enough to handle normal traffic coming into Sunland. Why don’t you simply get on the 210 freeway at #11 entrance like most people who drive for two+ hours each day to the beach? If you don’t like that, you are welcome to speed down Sunland Blvd with its four lanes of 45mph speed limit and equestrian trail adjacent. They are no side streets from Lake View Terrace into Sunland, in case you did not know that. ZERO bikes use the lane? Now gridlock? Sir/Mam, no offense but you are a liar. I have lived in Sunland for 4 years and taken that route home every M-F for those 4 years. I haven’t seen 1 bike in all of that time. My opinion is that it’s ridiculous to take out a lane that will undoubtedly increase traffic for the few (if any) bikers. Thanks to these bike lanes on Foothills Blvd I can now (somewhat) safely bike to work regularly. That means one less car on the road crowding your commute and polluting the air you breathe. Thank you for sharing the road with bicyclists! Removal of one of two lanes on a major highway – yes, Foothill Boulevard is classified as a major highway, is irrational, unsafe, and a public safety hazard for all of our stakeholders. If there is a way to support a bike path without disrupting the normal traffic for those who used to enjoy a lack of traffic in our lovely town of Sunland, then okay, let’s add it to the road. But at the expense that we are now paying – not smart, and definitely reflects a lazy approach by DOT to solving speeding problems. Come on DOT, you can surely come up with a much more logical and well planned strategy than taking away one of two lanes on a main road, can’t you? The residents who live closest to this can now pull out safely from their driveways and side streets. Delivery personnel can now safely stop their vehicles, get out and not risk being hit from behind. There are other paths to use if the time you leave is too jammed up. An extra 5 mins or so over the safety of community neighbors is okay with me. Not only did a cyclist die, a young man died when his vehicle flipped after hitting another head on. Speed was a factor. This slows it down. Lankershim bike lanes, Cesar Chavez Avenue improvements, Foothill Transit services changes, and much more this week.